Activate Slider / Featured Content. This is the documentation page of the Arouse WordPress Theme. We will try to keep everything well documented. If you are not sure about particular area of this please use the support forum. After the purchase, you should have received your API key to your email.If you haven’t got it please go to https://themezhut.com/my-account/my-api-keys/ and get your API key. Then please navigate to “Dashboard > Settings > Arouse Pro Theme Activation” to enter your API key and API email. After entering the details hit the “Save Changes” button. 5. Activate Slider / Featured Content. First of all you should have selected to display latest posts on Front page. 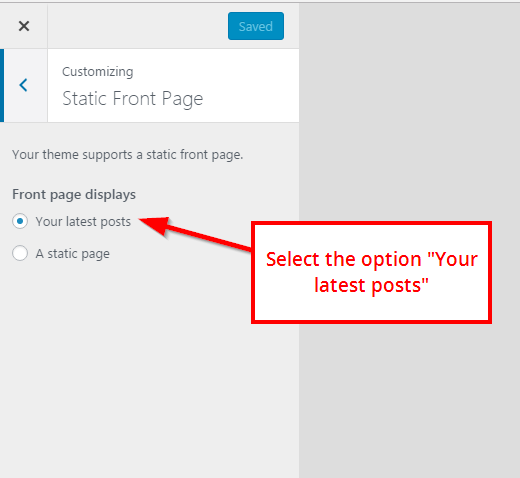 Go to Appearance > Customize > Static Front Page and select “Latest Posts” option for the “Front Page Displays” setting. 1. Go to Appearance > Customize > Slider. 2. Check the ‘Display slider?’ check box. 3. Then select the category of posts which you want to display in the slider. ( Featured images of the posts of the selected category will be displayed as slider images. – Featured images of posts should be at least in width of 1070px and in height of 500px to display slider images properly. 4. If you are using Arouse Pro you can add custom images with custom titles and links. To use custom slider select the “Custom Slider” under the setting “Select slider Type”. 1. Go to Appearance > Customize > Featured Content Boxes. 2. Mark the ‘Display featured content section?’ check box. On Arouse Pro you can use the magazine widget area to display “Posts Block Widgets” in magazine style. Just Drag and drop following Posts Blocks to magazine widget area. Following are the widgets included in the theme. Arouse Pro: About Me widget. Arouse Pro: Social Media Widget. Drag and drop each widget to the relevant widget areas and arrange them any order you want.